The Vitalizer Plus is inspired by the natural principles found in nature to revitalize drinking water while making it more beneficial and easily assimilable by our body and by our cells. Water, in it's natural state, is constantly moving (vortex, swirls). It's also rich in dissolved oxygen, (waterfalls and splashes) and it energized by the sun and the magnetic energy of the earth. It is also mineralized by the rocks and other minerals that happen to be on it's way. The Vitalizer Plus uses those same natural principles to offer you a revitalized water in your own home. The Vitalizer Plus restores the natural properties of water, making it structured and alive, to bring beneficial nutrients that enhance the internal balance of your body! How does the Vitalizer Plus work? Simply plug the Vitalizer Plus into an electrical outlet and chose one of the three settings (9, 18, or 27 minutes) to revitalize your water. The mineral cube at the bottom of the pitcher remineralizes the water while increasing the pH by 1 to 1.5 points. Water treated by reverse osmosis with a pH of 5 to 5.5 will increase to a pH of about 7 or neutral, while tap water or spring water with a pH of 7 will become alkaline with a pH of 8 or 8.5. 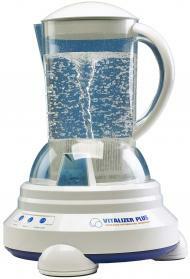 Warning - The Vitalizer Plus is not a water purifier and does not have filtration capacities. If you are using tap water, it is preferable to filter it or to let the chlorine evaporate from it for a couple of hours before pouring it into the pitcher. We strongly recommend you to use the Vitalizer Plus with a BERKEY® Water Purifier, for an ultimate winning combination. Explosion causes destruction with a loss of energy. Implosion also causes destruction, but contrary to the explosion, the destruction is caused by a very high concentration of energy. Think about a tornado and the force and energy concentrated at the center of the funnel. 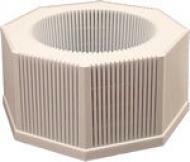 This is the same principle produced in the water with the Vitalizer Plus. The magnets located at the bottom of the machine make the spinner located at the bottom of the pitcher, creating a vortexing movement in the water. The concentration of energy is so strong at the center of the vortex that it causes large destructured water clusters to implode. Once the molecules are dissociated from one another by the strength of the implosion, the H2O molecules will naturally reorganize themselves and link together again in a perfectly balanced structure, creating hexagonal and symetrical micro-clusters (think of the symetrical structure of a snowflake). That is what is referred to as structured water, and it is this form of water that is best absorbed by our cells. To learn more about the benefits of structured water on your health, visit our section "Micro-clustered water"